This is a manual designed to get White Belts to competent Blue Belts in as fast a time as possible. What is the guard and how do we utilize it best? What options do we have from guard? Why is posture and distance important? The mount is a powerful position but how do I get there? ... And when I do get there, how do I stay there? This is a great manual for anyone just starting Brazilian Jiu Jitsu, Traditional Jiu Jitsu, MMA and Grappling. So I picked up this, the second book in the series, first. About halfway through... I grabbed the first one as well! I have been practicing martial arts for over 25 years & teaching for over 16 years. I recently started BJJ & I learned more from this book than six months in class!!! absolutely the best book out there for beginners. I have just finished listening and am about to press repeat! This book is not a how too but if your very new to jiu jitsu it gives you a good start on what you should be focusing on, and a good foundation of general concepts. I've been practicing for about a year and a half almost daily, currently a four stripe white belt. Absolutely great information, a lot of important concepts to think about, and a lot of further reading suggestions offered. Would recommend to anyone who is starting jiu jitsu through newly promoted blue belts. narrator sounds too dry and mispronounces a lot of BJJ terms and names like Rickson Gracie & De La Riva. No shade thrown though. Great read! This narrator was difficult to listen to. If I were reading this book with a hi-liter in hand, I wouldn’t need to remove its cap. It’s stated that this book is more about mindset, and not technique. That’s fine. There weren’t any gems in the first 4 chapters, and I’m not going to be completing the book. This book may be useful for someone with low self esteem or the inability to plan long-term goals. Wrong... and wish I could get a refund. 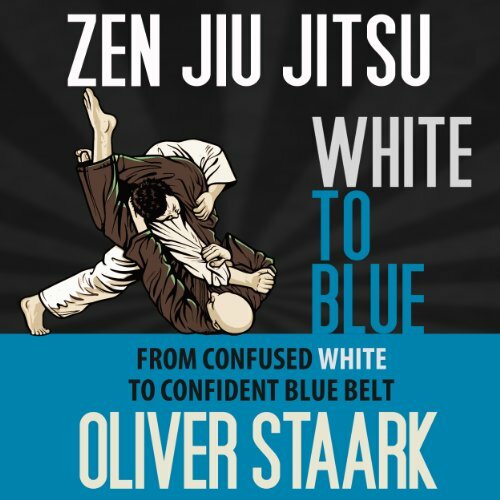 Skip the audio version - it's got a few memorable quotes but as a zero stripe, white belt - I found the audio book almost worthless. A must have for BJJ practitioners at any level! Just finished for the third time. A must have especially when the fire goes cold. A reminder of how long the journey is and to enjoy every roll.